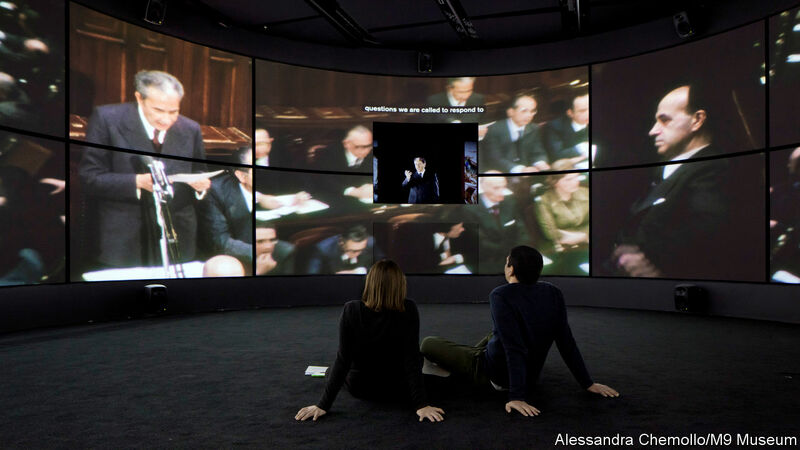 “AND THIS,” says the guide, drawing back a black curtain and beckoning your correspondent into the gloom beyond, “is the only museum in the world in which you can dance.” Along one wall of the room is a giant video jukebox. Hit one of the buttons and you can see and hear—and dance to—a sample of what moved Italians to kick up their heels at different times in the 20th century, from the pre-war tarantelle to the electronic beats that were pulsing through Italy in the 1990s. Gianni Toniolo thinks the Museo del Novecento, which opened last month in Mestre, on the mainland opposite Venice, may be unique in other ways. Mr Toniolo, an economic historian who advised on the selection of its content, reckons the only comparable display space might be the Maison de l’histoire européenne (House of European History) in Brussels. The M9, as it has swiftly come to be known, has almost no material exhibits. 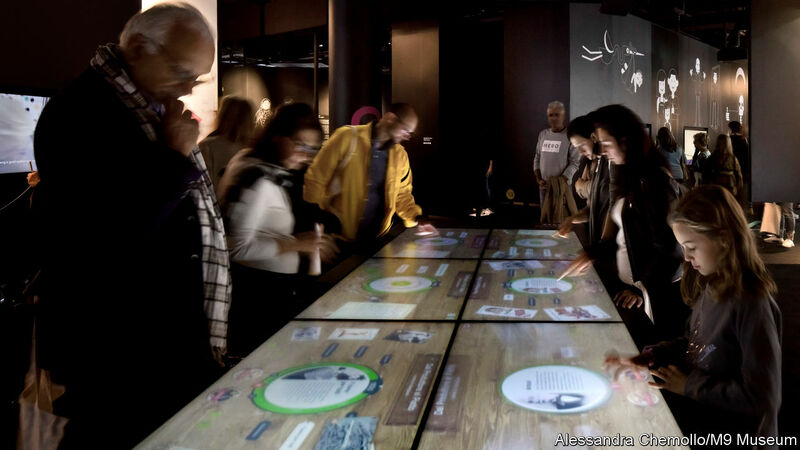 It relies on digitised videos and photos presented to the visitor in various creative ways: in interactive slideshows and 3D tableaux, on gesture-activated screens and as virtual reality. Italy is littered with musei del Novecento, but the others are galleries of 20th-century art. This one is different. It offers a thematic chronicle of Italy’s recent history and its breakneck transformation from a rural and agrarian nation before the second world war into an urban and industrial one after, and more recently (and hesitantly) into the post-modern, increasingly services-based and digitalised society of today. Another obvious danger was to have dodged the tricky issues. Mestre is in the Veneto, the heartland of the Northern League, which has morphed from a proudly democratic, regionalist party into a hard-right, nativist one. So it is surprising that the M9 has not created more of a stir with its generally liberal take on issues such as immigration (the relevant display bluntly states that a country like Italy with a low birth rate needs immigrants). Marco Biscione, the museum’s director, sees three target markets for the M9. Top of his list are young Italians, who often learn at school more about the distant pasts of foreign lands than their own country’s recent history; then there are their older compatriots. But he also has his eye on the 1.2m tourists, many of them non-Italians, who pass through Mestre each year. Most stay there to save money and then head off at the first opportunity to see the sights of Venice. But, he says, “Brand Italy works and is in vogue. This museum could enrich their experience.” A British woman watching a presentation of changing urban geography thought the M9 was “fantastic”—but then she was married to an Italian and living in Rome. Others are perhaps more likely to be drawn in by the M9’s temporary exhibitions. The inaugural one is a stunner—a display of many of Italy’s best 20th-century photographers. The images range from Franco Fontana’s Rothko-like compositions, crafted from artfully observed reality, to Gianni Berengo Gardin’s moving portraits of mental patients and Letizia Battaglia’s harrowing images of the “Mafia war” that the Corleonesi waged in the 1980s on the established mob clans of Palermo. Visitors will leave marvelling at—and, in some cases, maybe despairing of—entrancing, infuriating, perilous, comforting, sinful, sacred, seductive Italy.